Update #4 : Shining Smile has noted on their website that shipping was due to ship at the beginning of July, however this was pushed back to the end of July due to delays in the delivery and their receipt of the books and/or freebies. As you all know, there has been horrendous weather in Korea and Shining Smile has said that these conditions have further delayed the beginning of the photobook shipments. They have given no further indication of when they photobooks will be shipped, but have asked us to remain patient. Update #3 : ORDERING PERIOD IS NOW OVER AS OF JUNE 30th 2011. Update #1 : Special gift for early deposit does not apply to overseas orders. There will be a random and special gift for overseas orders. Shipping dates have been changed from early July to mid July. Shining Smile will be releasing their 1st Photo Book of Tiffany. Profits from the sale of the photo book will be used for the support of Tiffany. -Includes photographs of Tiffany taken from 2008 to 2011. -There will be a random and special gift. This is currently a secret. Gifts subject to change. -If you wish to order more than 10 books, send an email to ‘tiff801@hanmail.net’, and include in your email your address and how many books you would like to order. 2. Press the ‘write’ button. Fill in the relevant details at the top. Make sure you tick/check the ‘secret’ box, otherwise your info will be public on the web. 3. Copy and paste the form above in the ‘comments’ section, filling in your details. The form can also be found here. 4. Press the ‘write’ button to post your form. Notes: For the ‘name’ and ‘pass’ sections, it matters not what you put there. However, if you wish to check your post again after you’ve submitted it, choose a password you remember. Note: Your post will be deleted once your payment has been confirmed. Special gift for early deposit only apply to Korean orders? and how can an overseas order can get a special gift? Hmm it seems I can’t open it in firefox but open fines in ie, maybe it’s my adblocker, thanks. just curious has anyone purchased a book yet? ^^ Thanks soshicatalogue for the screencaps..the sample photos don’t look that appealing to me! I hope there are more HQ up close photos though! Hey just want to ask how do i know that they have confirm my payment? thanks for this easy step-by-step tutorial!!! Anyone knows EMS shipping rate for 20 books to Zone 1 is? I emailed them many times…. Each time only answer me 1 question or no answer at all. I was told best shipping rate is 20 book per box. Then I was told it is $145 which is more than double of $68 which is box of 10. So it is really confusing.. It is probably best then to just email them one question at a time. Or number them in a list to make it clear to them. Probably best bear in mind that most of them likely don’t speak much English (if at all) and so will rely on online translators to help decode questions. They don’t reply to all the email either. Can anyone translate these two questions into Korean for me? 1. 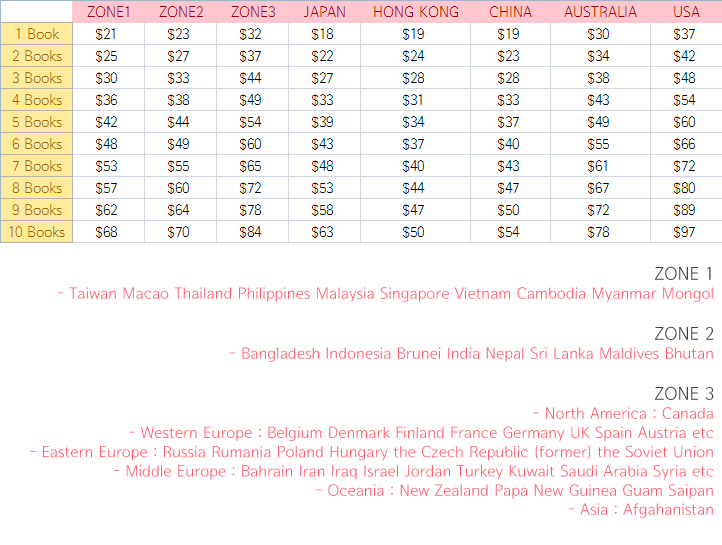 How much is EMS fee for 20 books to Taiwan (Zone1)? 2. How much is EMS fee for 80 books to Taiwan (Zone1)? Anyone knows if the pictures will be all fantaken or screen caps will be included? Thanks! Do y’all think this is worth it? I mean, Shining Smile has some pretty amazing photos for the Hoot and later performances, but I’m not sure about the earlier ones. Yeah, I thought their photos were like, really professional and capture Tiffany at her best. But I saw their earlier photos and true, they were high quality and still pretty, but not very… outstanding? I’m so torn as to whether I should buy it! Like the sample photos, the two photos at the top from the more recent SNSD performances are really beautiful, but the bottom two are rather normal. Will there be a second round of ordering? May I know when will they start shipping? Yeah it has been quite awhile already anyone knows? Look like there a mini poster included.. hopefully overseas buyer will get it too..
our overseas order arrived! mini-poster, pics, pen, etc included. also just picked up mine today from post office….I’m in US. The mini-poster is like 10.25×7.25 inch…. Simply wish to say your article is as surprising. The clearness in your post is just great and i could assume you are an expert on this subject. Fine with your permission let me to grab your RSS feed to keep up to date with forthcoming post. Thanks a million and please keep up the gratifying work.